If one had asked a Beaumonter on January 1, 1901, what big news of recent months had most interested him, he would have said the great Galveston hurricane of September 8, or the dawning of a new century. If one had asked him on January 10, he would have said the great gusher at Spindletop - a salt dome about three miles south of Beaumont. 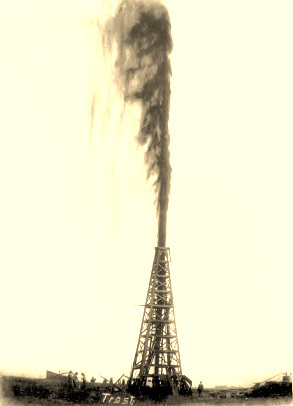 Dubbed "The Lucas Gusher," the oil discovery on Spindletop Hill changed the economy of Texas and helped to usher in the petroleum age. The Lucas Gusher gave up its riches for nine days before Anthony Lucas and the Hamill brothers could get the well under control. We re-create the gusher using water and only run it for about 2 minutes. But it is always fun to watch how high the water will blow and what direction the spray will take. 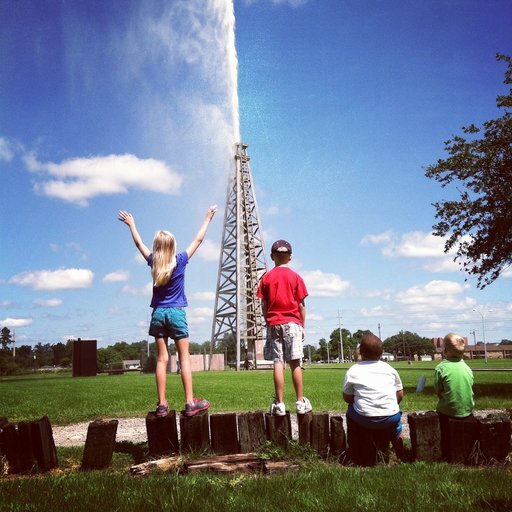 It is always free to enjoy the gusher re-enactment. Regular admission fees apply to museum entrance. TIMES ARE APPROXIMATE AND SUBJECT TO CHANGE. WEATHER AND OTHER CIRCUMSTANCES MIGHT CAUSE CANCELLATIONS. CALL TO CONFIRM. See our calendar for all events. Come meet the citizens of Gladys City! Participate in the life of the turn of the century boomtown. For a small donation receive 1901 money to spend in the town. Gusher at 12:00. Free admission.